During the opening of our new exhibition Wildlife Photographer of the Year we had the opportunity to welcome a special guest: Scott Portelli, an Australian photographer living in Sydney has already travelled the world extensively and took pictures in some of the most remote destinations like The Arctic, Antarctica, Galapagos, etc. He spent hundreds of days in pursuit of different wildlife. Due to his experience, he is privileged to be up close and personal with many creatures. Scott has already won multiple awards, this year he got selected by Wildlife Photographer of the year and his picture can be seen in the exhibition. I have been taking photos for over 20 years, but only started to work professionally from 2007. I studied photography briefly at university but for the most part, I am self-taught and continue to learn each and every day. My advice to new photographers is to look at as many photographers, artists, filmmakers as possible to look at what is out in the world so you appreciate the style, process, imagination, artistry of others, which will eventually help you to form your own style and visual communication. Photography allows me to push the envelope and look at the world differently. It allows me to communicate important messages or inspire others. I love taking photos in different parts of the world and showing people how amazing this planet is we live on. I never stop learning, which the amazing thing about being a photographer and meeting other photographers or like-minded people. It is a pure expression of joy and I am glad I found photography so many years ago. What drew you to wildlife photography? Photographing wildlife is challenging, unpredictable, intimate, educational and allows me to take a glimpse into their world. I love learning about wildlife behaviour, habitat and interactions. Understanding your subject matter means you will have better opportunities to capture them in their natural environment. It is a humbling experience, to say the least. The other aspect is being able to produce imagery and content that inspires others to act or protect these animals and be evangelists for conservation and animal causes. I use a lot of equipment if I am shooting on land I have a Canon 1 DX MK II with a number of lenses: telephoto, fisheye, macro. If I am shooting underwater I have a rig for my DSLR with 2 x strobes and dome ports for wide-angle lenses. I am also a licensed drone pilot so I have a drone I use to shoot video mainly. 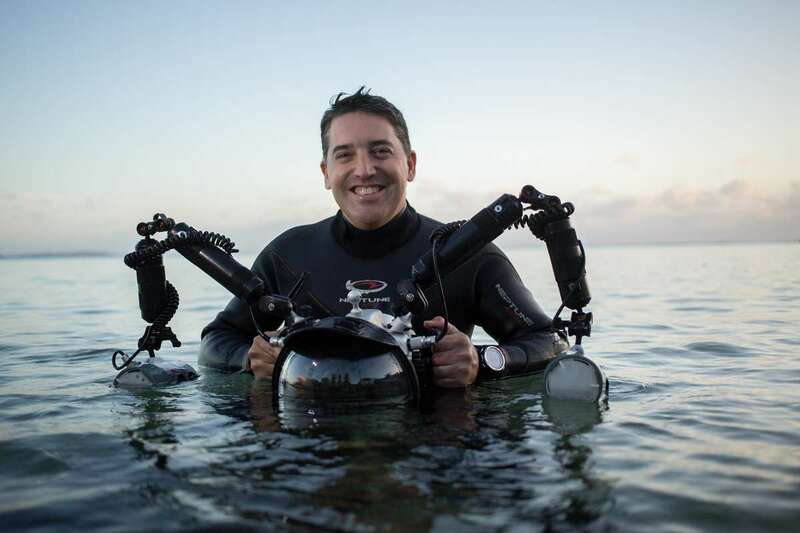 But each job requires different equipment, so there is often multiple pieces including gimbals, underwater gear, time-lapse systems, sliders etc. Do you have a favourite photograph from your career? I honestly can’t pick a single image, so maybe I will just talk about one of the shots in the WPY52 exhibition. I took the shot of a cuttlefish mating/courting in South Australia as part of a personal project I am working on that will span five years. It was one of those days where everything aligned, good weather, clear water and thousands of cuttlefish. I sat patiently on the bottom watching as the cuttlefish went about the business of competing for the right to mate. I was shooting with a Canon 5D MK III in a Seacam Underwater housing with 2 x Ikelite strobes and a fisheye lens. 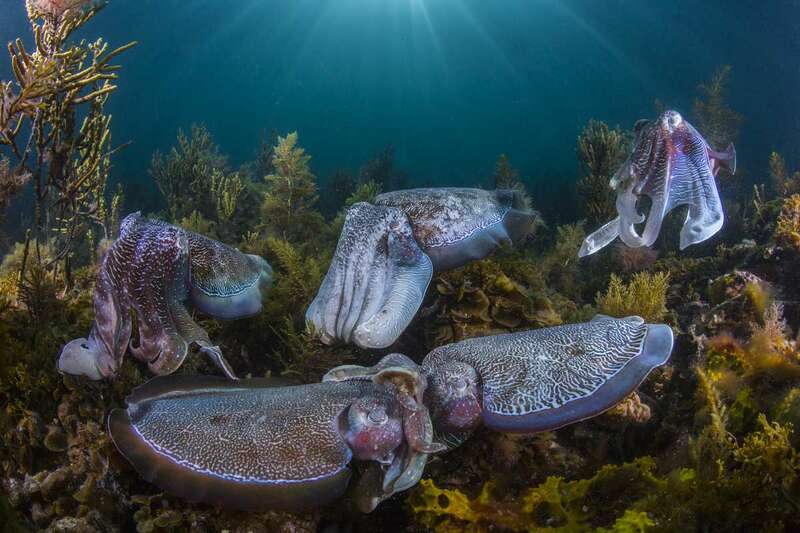 Scott spent hours in the cold shallow waters capturing one of nature’s greatest events: The spawning of giant cuttlefish. In this aggregation, a line of suitors are poised in the background, waiting for a chance to mate with the female. Scott finally framed the ideal composition when the onlookers momentarily faced the same way. Image: Scott Portelli ©. How do you see your future in photography? I think my photography career will take me to different parts of the world and allow me to use the opportunities to educate others about conservation as well as show them rarely seen species that live on the planet. As a photographer you need to be able to diversify, I am a photographer, videographer, writer, drone pilot, social media marketer, etc because I need to be. The one thing about photography is you need to be versatile and adapt to new ideas, techniques and ways of capturing the world through your lens. What are the characteristics of a good wildlife photographer? Patience, knowledge of your subject, ability to be comfortable in any environment are some of the key things to being a wildlife photographer. And respect for the animals and their habitats will make you appreciate what you are seeing and doing even more. Photographing wildlife can be difficult and you may spend days, months and even years chasing a shot, so you need to relax and accept every situation for what it is. The minute you get frustrated if things are not going your way that is the time you start to lose sight that these are wild animals and they don’t interact on cue. So patience, more patience and then a little more patience. How do you work, what are the steps you take to take a master shot? Depends on where I am in the world, but basic workflow can start with simply choosing the right equipment to take on location, developing a shot list if I am shooting for a client or developing a concept for an image I am trying to create. Once I am on location I will determine the conditions and adjust to accommodate the environmental factors. Once I have found the subject I may spend a bit of time watching their behaviour, often if animals know you are around it can take a bit of time before they are relaxed. But I have so many different workflows for photography, video, drone flying, underwater shoots. They all require a great deal of preparation and I even use checklists to make sure I minimise the human error. I think I could talk for hours about workflow and preparation. I am inspired by so many photographers and they are not all necessarily famous well known. And with the influx of social media, it is now so easy to come across some amazing artists out there in the world so I admire many people’s work. I also admire people trying to change the world for the better. But I love seeing the influence of people like Attenborough for their effect on the natural world and making it mainstream. I love visiting the polar regions and admire the work of Paul Nicklen in this part of the world, in the underwater world David Doublet. Filmmakers like Howard Hall or cameramen like Doug Allen. There is just too many to even name and some of them I met while in London at the Wildlife Photographer of the Year, which was a great feeling to be considered part of this calibre of photographers. 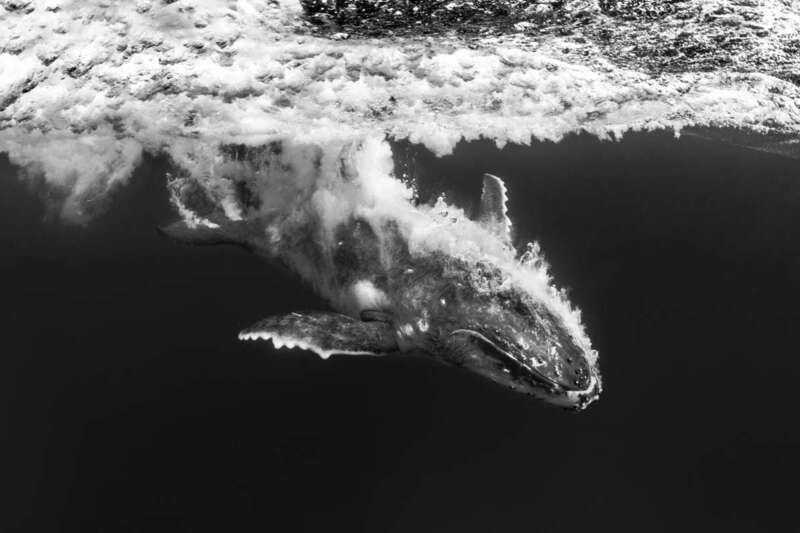 A young baby whale propels its 3 tonne body out of the water as it breaches less that a meter away from Scott, the jetstream of bubbles is the trail it made as it re-entered the water. Image: Scott Portelli ©. What is the weirdest experience you’ve had while photographing animals? I was photographing Humpback whales in Tonga and I jumped in the water to swim towards the whales. I was swimming toward the shadow as I had done many times before, as I got closer the shadow appeared to be a yellowy cloud, I thought my mask had fogged, but upon further investigation, I realised what had happened: This whale had defecated on me! I was swimming straight through the middle of it! It was definitely a first for me, and I assumed almost immediately that it would probably be the last. But like all good myths about never being struck by lightning twice in the same place, I was to be honoured by the whale for a second consecutive time. Yes, I thought to myself, another one of those memorable moments. – Axel Gielen, Marketing and projects intern. Be sure to book your tickets for a wonderful afternoon at Wildlife Photographer of the Year today.